All recipes, except the cookies, came from The Lavender Cookbook by Sharon Shipley. 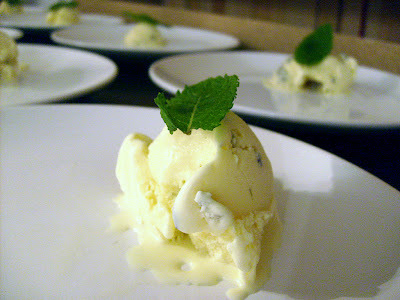 The crowd favorite was the ice cream (recipe below). In a post from January, 2008, I admitted that I love eating lavender, thanks to my friend Sue, who introduced me to lavender "better butter" a few years ago. As I wrote in my Christmas Cookie post, if you've never eaten lavender-laced food, you must try it. 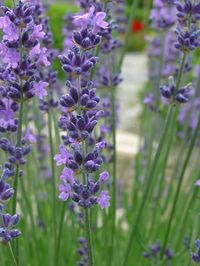 You can buy lavender from upscale spice shops like Penzey's or The Spice House. I ordered a large container of dried lavender from Amazon, but when I searched there today, I didn't find any. If you live in the St. Louis area, you can harvest your own lavender at Winding Brook Estate Farm in Eureka, Missouri. They are harvesting through October 25 and are open Wednesdays through Sundays from 10-4. In a medium saucepan, whisk together the milk, honey, lavender, and 3/4 cup of the cream. Heat, stirring often, until small bubbles start to foam around the edge. DO NOT BOIL. Set aside to cool slightly. In a large bowl, combine the egg yolks & sugar. Beat until the mixture is a lightly lemony yellow. Slowly beat in the milk mixture. Pour back into the saucepan. Cook over medium heat, stirring constantly, until the mixture thickens enough to coat the back of a spoon. Strain into a medium bowl. Stir in the vanilla & remaining cream. Chill before freezing in an ice cream machine. This ice cream is PURE heaven. I thought the breeze picking up the subtle scent to drag by my nose was the best thing to come from lavender, and then I ate this ice cream paired with a lavender sugar cookie...I've found a new passion! Yum Yum Yummy! So many uses for lavendar! I will have to check out this Sharon Shipley character. Thanks for sharing. how delicately feminine! this would make a great mothers day dessert.